On our recent fishing charters we have been Tautog fishing. Tautog are often known as Blackfish. On April 6th 2016 we had a small group on board with us to do a half day fishing charter. We left out of Vinings Landing Marina in Norfolk Virginia at 8 am. Our marina is located close to the Chesapeake Bay Bridge Tunnel making it a quick boat ride to our first fishing location. Click here to book your Tautog fishing trip today! With the weather being cold it makes for great Tautog fishing. 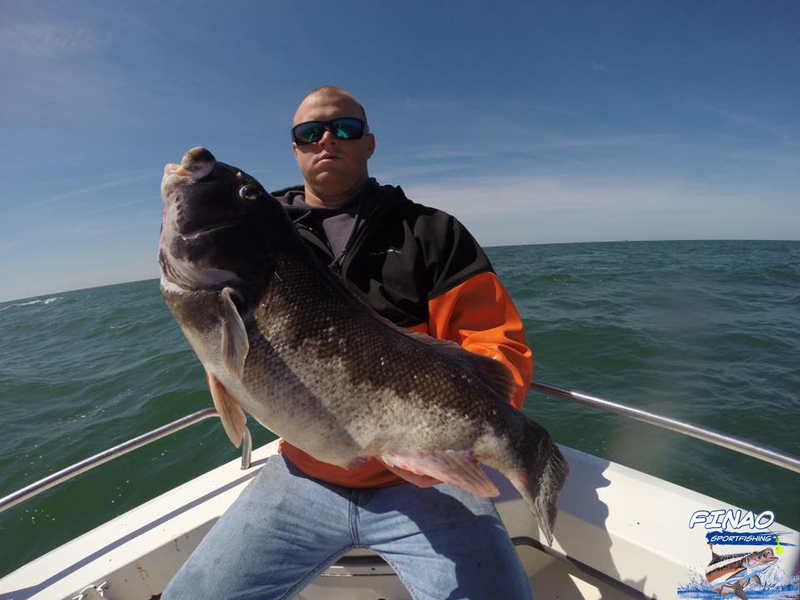 Tautog are a cold water fish abundant in the Chesapeake Bay from September – May. Tautog are known for there hard fights and skill to catch them. These fish live in rocks, wrecks, and any structure found on the bottom. When targeting Tautog it can be tricky to catch them. When they are living in the rocks they often eat your bait and break your line on the structure. The bait we use on our Tautog fishing charters is Blue Crabs, Fiddler Crabs, and Clams. This time of year Tautog move into the Chesapeake Bay to spawn. In the Spring is when we get our largest Tautog. They are full of roe and eat as often as possible in preparation to spawn. With the larger fish around it is important to use the correct gear. The gear we use when Tautog fishing is Avet Reels, Power Pro Braided Line, Shimano Rods, and Owner hooks. This gear is top of the line and ensures your best chance at catching a Tautog of a lifetime! Tautog fishing can be tricky but a blast to learn. Fishing with Finao Sportfishing we will make sure you enjoy your experience and master the technique of Tautog fishing. Tautog fishing will be excellent until May 1st. Be sure not to miss out on some of the best fishing Virginia has to offer!